Large enough to swallow three planets the size of the Earth, Jupiter’s Great Red Spot (GRS) is the greatest and most persistent anticyclonic storm in the Solar System, having raged in the planet’s atmosphere for at least 400 years. But what gives the GRS its characteristic ruddy colour? Researchers at the US space agency NASA have revealed, the ruddy color of Jupiter’s famous Great Red Spot is likely a product of simple chemicals being broken apart by sunlight in the planet’s upper atmosphere. These results contradict the other leading theory for the origin of the spot’s striking color – that the reddish chemicals come from beneath Jupiter’s clouds. Scientist Kevin Baines at the American Astronomical Society’s Division for Planetary Science Meeting in Tucson, Arizona with NASA Jet Propulsion Laboratory colleagues Bob Carlson and Tom Momary, now believe the colour of GRS is likely a product of simple chemicals being broken apart by sunlight in the planet’s upper atmosphere, basing their conclusions on a new analysis of data from Cassini’s December 2000 Jupiter flyby and laboratory experiments. 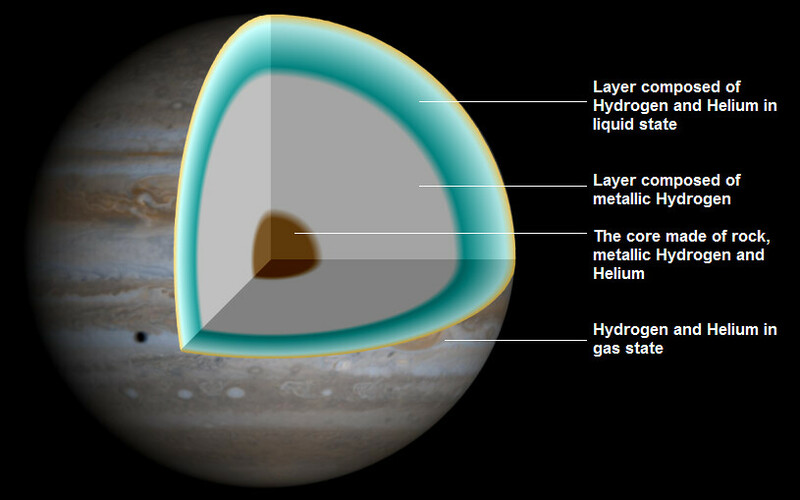 Jupiter is composed almost entirely of hydrogen and helium with a scattering of other elements. If scientists can understand what combinations of elements are responsible for the colours seen in Jupiter’s clouds this would provide insights into the giant planet’s make-up. Jupiter possesses three main cloud layers which, from highest to lowest, are ammonia, ammonium hydrosulfide and water clouds. In the lab, the researchers blasted ammonia and acetylene gases with ultraviolet light, to simulate the sun’s effects on these materials at the extreme heights of clouds in the Great Red Spot. This produced a reddish material, which the team compared to the Great Red Spot as observed by Cassini’s Visible and Infrared Mapping Spectrometer (VIMS). They found that the light-scattering properties of their red concoction nicely matched a model of the Great Red Spot in which the red-colored material is confined to the uppermost reaches of the giant cyclone-like feature. “Our models suggest most of the Great Red Spot is actually pretty bland in color, beneath the upper cloud layer of reddish material. Under the reddish ‘sunburn’ the clouds are probably whitish or grayish.” Baines said. “The Great Red Spot is extremely tall. It reaches much higher altitudes than clouds elsewhere on Jupiter,” He added. “The spot’s winds transport ammonia ice particles higher into the atmosphere than usual, where they are exposed to the sun’s ultraviolet light. Additionally, the vortex nature of the spot confines particles causes the redness of the spot’s cloud tops to increase beyond what might otherwise be expected”. Results were presented at the Division for Planetary Science of the American Astronomical Society’s annual meeting this week in Tucson, Arizona. A press release did not disclose publication plans or if the research is peer-reviewed. In the title, is that the UK spelling, or was mystery spelled incorrectly?